The first thing you notice as you approach the Prairie Club in the sandhills of Nebraska is what's not there. You cruise through the "big' town of Valentine (population 2,830) and 17 miles later you see the first indication that a big-time golf resort is nearby. It's just a small sign saying the entrance is a half-mile away. Then you hit the entrance - just a small sign as well - and face a two-mile drive down a winding dirt road to the clubhouse that, most notably, takes you by some mean-looking cattle. Then the fun begins. At the Prairie Club the accommodations are more than comfortable. The decor has a rustic elegance that includes leopard carpeting on the stairs. The food is good, the atmosphere memorable, the staff extremely friendly and helpful. But at the Prairie Club it's all about golf . You can have your fun on its two 18-hole courses as well as its unique 10-hole Horse Course, a par-3 layout that has no tee markers. An interesting place, this Prairie Club. There's not many golf options around it, but plenty inside its ample borders. This place is pure golf, just what founder Paul Schock wanted when he got the place up and running on June 11, 2010. The Horse Course is unique. Gil Hanse, now famous as the designer of the Brazil course that will host next year's first Olympics golf competition since 1904, created it. You play the Horse Course like you would play that popular game in backyard basketball, hence the name. The Horse Course spurs creativity as well as fun competition. Too bad more golf facilities don't offer such a course. Golf, as played on the Horse Course, would bring more players into the game. But I digress. The Prairie Club is a lot more than the Horse Course. The Dunes Course, designed by former British Open champion Tom Lehman with guidance from Chris Brand, is long - a par-73 that can play at over 8,000 yards from the very back tees. This is one of those courses where it's imperative you play from the right set of tees. If you don't you could well be in for a long day. The length shouldn't dissuade you, though. Neither should all the weird-shaped bunkers, some of which have "blowouts' in them and some of which feature what look like Pete Dye railroad ties placed in a much-less-random order. They're more like fence posts. No, you don't, and if you get behind one you're dead. The "blowouts,' native to the sandhills so prevalent in the area, are featured in the wide area of waste bunkers throughout the layout. You never know what you're going to get when you go into those bunkers. The other 18, called the Pines, is also a par-73 but much different than the Dunes. The Australian star, Graham Marsh, designed that 18, which is more playable for the average player and perhaps easier than the Dunes - even though the greens are more severe. Regardless of how you compare the courses, the views of the Snake River Canyon offered on the Pines are stunning from the Points of Solitude viewing spot behind the No. 16 green. There's one thing about the Prairie Club that's historically amazing. It was built in just over five months. That seems astounding, given the time it takes to build or renovate courses everywhere else these days. 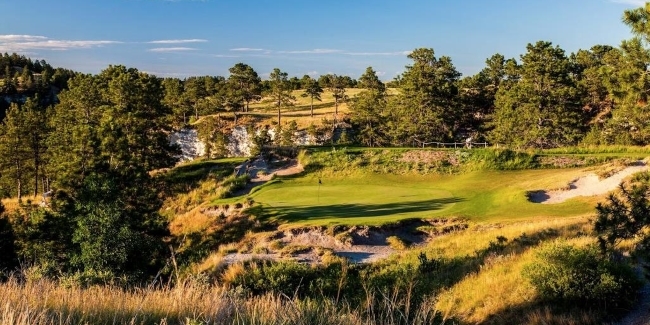 Prairie Club was spawned as the third big-time course in the sandhills. Shock had been a member of one, the 18-hole Sand Hills Country Club, designed by the noted design team of Bill Coore and Ben Crenshaw. The other, Dismal River, has 36 holes. Both of those are private clubs while at Prairie Club play is about half and half between its members (about 400 of them) and the public. The two private clubs had closed for the season by early October, when we visited Prairie Club. Nebraska has a surprisingly short golf season thanks to the unpredictability of fall weather. The sandhills area has been known to have snow in October, so the Prairie Club will close for golf on Oct. 18 and won't re-open until next May 13. There will, however, be some winter activities there, primarily to accommodate hunters and weddings.